Learn how to make the best garlic bread with crispy edges and a soft and buttery center. 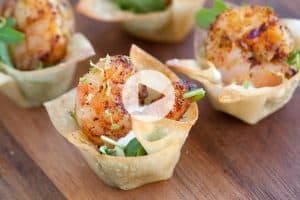 Simple to make and you can prepare it in advance. 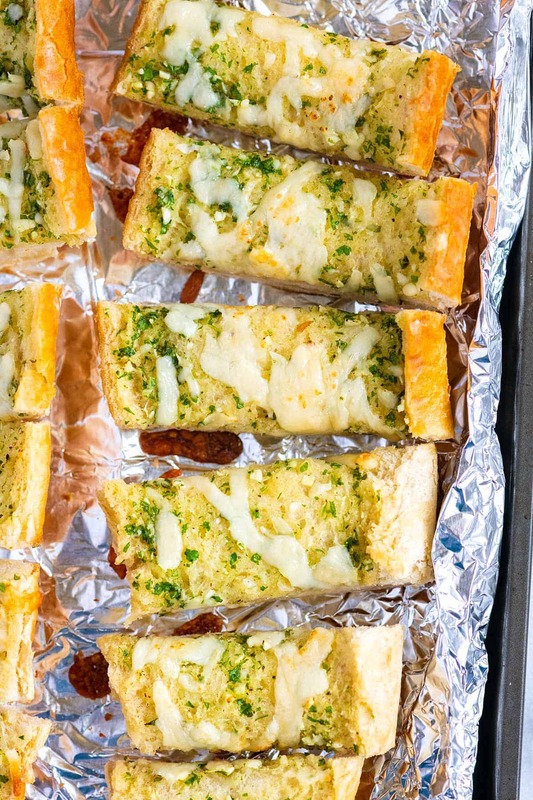 Jump to the Garlic Bread Recipe or read on to see our tips for making it. If you love garlic bread, then you need to see this recipe for Homemade Focaccia Bread with Garlic and Herbs. It has lots of rave reviews. After seeing how easy it is to make garlic bread from scratch, you will never buy store-bought or frozen garlic bread again. 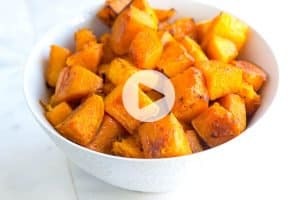 This recipe is so easy, and as a bonus, you can prepare it in advance. See all of our tips below. Bread — We love to use a French or Italian loaf of bread. Bread that’s not too crusty on the outside and that has a nice soft center is best. Think ciabatta bread or a simple French bread loaf. Butter — For the best results, we need softened butter. If you’re like us and always forget to take the butter out of the fridge in advance, we have a quick trick to soften butter. Cut the butter up into small cubes, then set them aside to soften. The smaller cubes of butter will soften much quicker than the whole stick. Fresh garlic — The amount of garlic can be increased or decreased depending on how garlicky you want things. No matter how much you use, mince it finely (or use a garlic press) to make sure that no one bites into a big chunk of garlic. 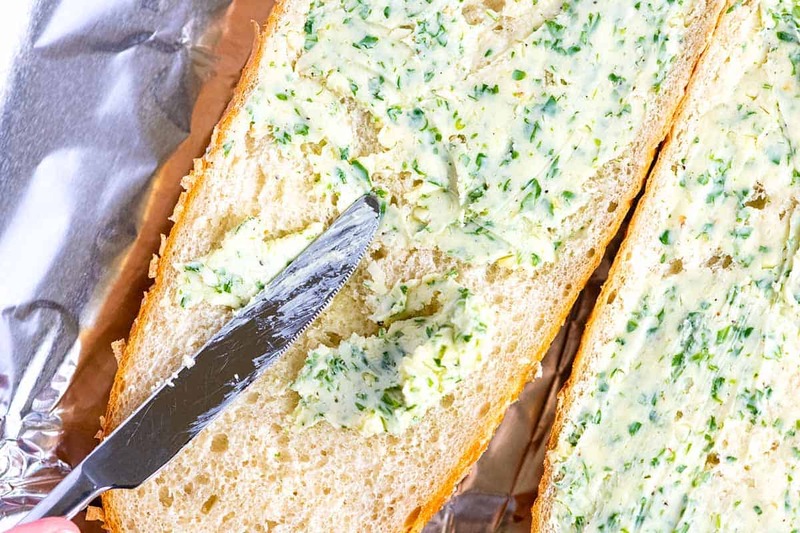 Parsley or basil — You can make this without fresh herbs, but for the prettiest and tastiest bread, we like to add a handful of chopped fresh parsley to the garlic-butter mixture. Basil is also lovely. Cheese — For the most decadent garlic bread, we love to add shredded mozzarella or parmesan cheese to garlic butter mixture. If you don’t have cheese on hand, you can always leave it out. Salt and pepper — For the best garlic bread, you need to season well. We add a generous pinch of salt and pepper to the butter before slathering it over the bread. Slice the bread loaf in half lengthwise. 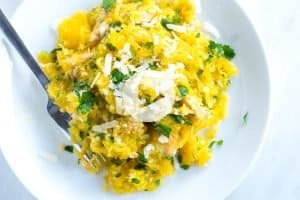 Make a garlic butter spread by mixing softened butter with finely minced garlic, chopped fresh parsley, a pinch of salt, and a pinch of pepper. Divide the garlic butter between the bread halves. Spread the butter out so that it covers the entire cut-side of the loaf halves. Wrap in foil (or parchment paper) and bake in a 400 degree Fahrenheit oven until the butter has completely melted into the center of the bread, about 15 to 20 minutes. Do I Need to Wrap the Bread in Foil? As I mentioned above, we love when garlic bread is soft and buttery in the middle. Wrapping the loaf in foil (or parchment paper) ensures this result. For a crispier garlic bread that’s more toasted on top, don’t wrap and bake for a shorter period (10 to 15 minutes). 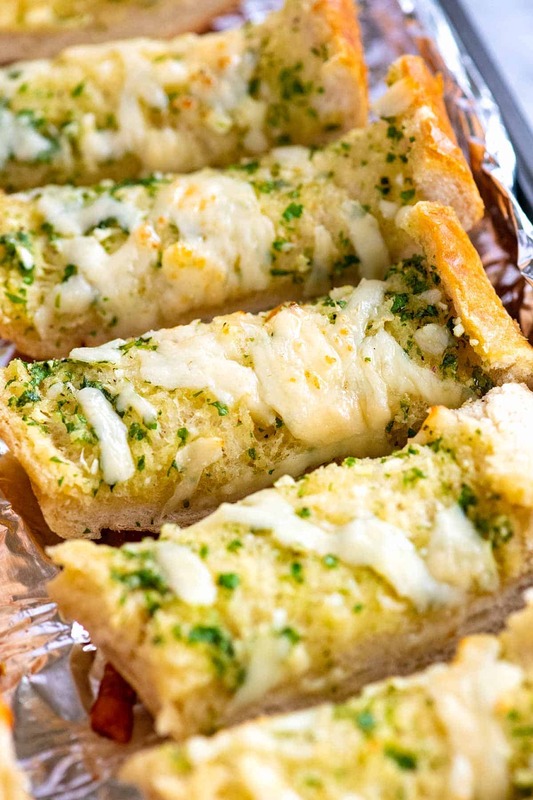 For another slightly more crisp take on garlic bread, see our basil and cheese garlic bread. Can I Make Garlic Bread In Advance? The garlic butter mixture can be made well in advance and kept in the fridge — think of it as a flavored butter. It keeps in the refrigerator for a week, if not more. When you are ready to make the bread, let the garlic butter stand at room temperature for 30 minutes or so before spreading it onto the bread and baking. The bread can be spread with garlic butter 8 hours ahead of time. Wrap it in foil and keep in the fridge until about 30 minutes before you are ready to bake. I love dipping cheesy garlic bread into a bowl of soup. Try this creamy vegetable soup, our three-ingredient tomato soup or this ham and cabbage soup. Instead of pasta, we love serving these tender turkey meatballs with garlic bread. The tomato basil sauce is made from scratch (it’s so easy). Swapping pasta for garlic bread is also an excellent plan when making our quick and easy shrimp scampi. This combination has my mouth watering. And speaking of pasta, this garlic bread would be incredible next to our easy buttered noodles, this meaty lasagna, or this sausage and spinach fettuccine alfredo. For the best garlic bread, use softened butter and a generous amount of fresh garlic. We bake the bread wrapped in foil and turn the bread once during baking so that the bottom crust of the loaf does become too hard. Set the oven rack to the center position. Heat the oven to 400 degrees Fahrenheit. Combine the softened butter, garlic, herbs, salt, and pepper in a small bowl. Use a fork to mix the ingredients together. Slice the loaf of bread in half, lengthwise. Face the bread halves cut-side-up, and then divide the garlic butter mixture between each half. Spread into an even layer all the way to the edges. Put the bread halves back together and wrap with foil. 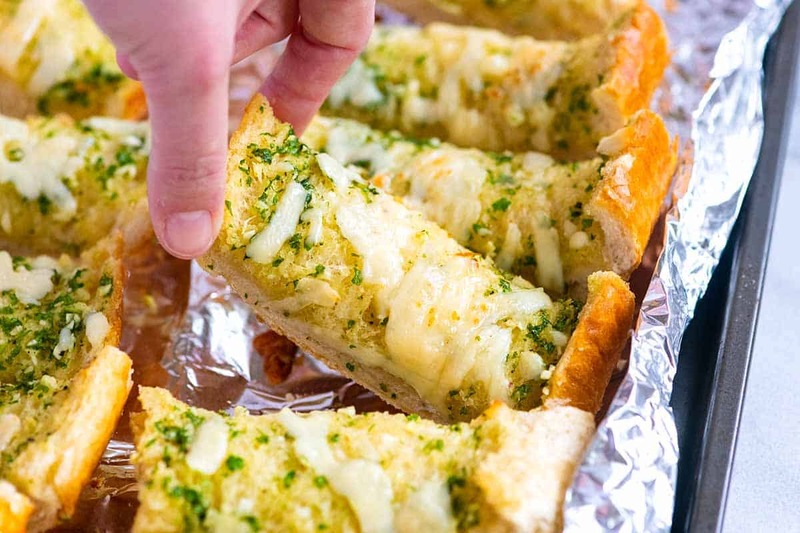 Place the wrapped garlic bread onto a baking sheet and bake for 10 minutes. Flip the bread and bake another 5 to 10 minutes or until the butter has melted into the middle of the loaf. Unwrap the foil then position the bread halves so that the cut-side is facing up. Scatter cheese over the bread then bake, uncovered, until the cheese melts and the edges of the bread crisp up a little, about 5 minutes. Slice the bread and serve warm. 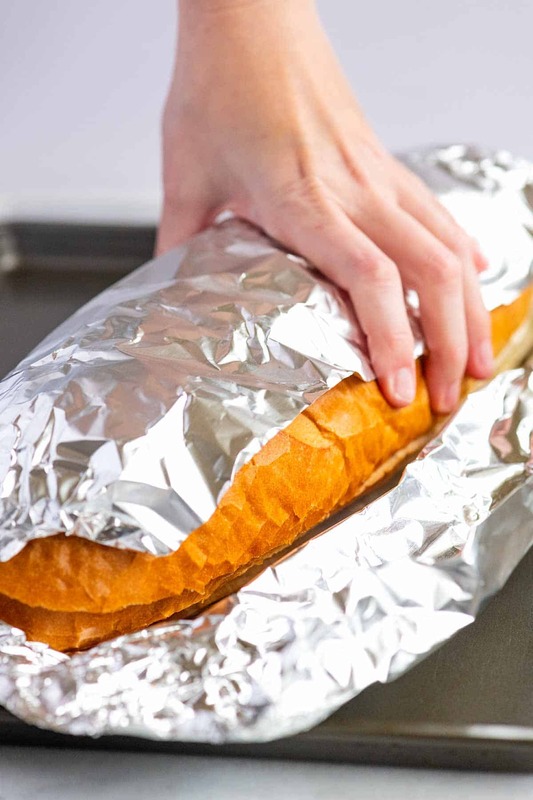 Keep garlic bread warm by wrapping in foil. Or wrap in foil and keep in a warm oven (170 to 200 degrees F). Using salted butter is fine in this recipe. 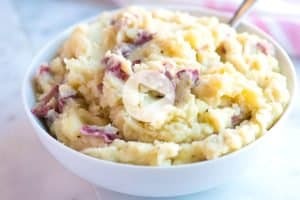 You may want to reduce the amount of additional salt you add to the garlic butter mixture.